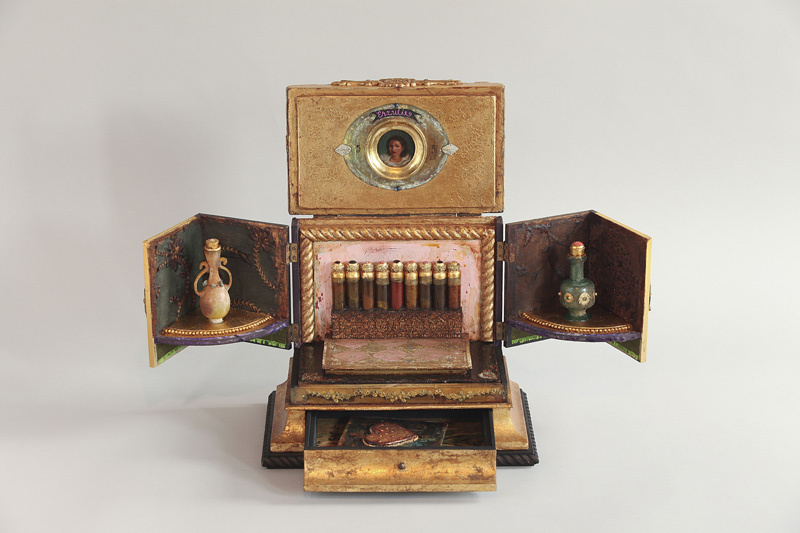 Renée Stout, Erzulie’s Arsenal, 2013. Photo courtesy of John Bentham. © 2013 by Renée Stout. Permission to reprint may be obtained only from the artist. This work appears on the cover of the Summer 2016 issue of Signs. The world seems to be at a crossroads, and in my recent works I address the power structures within our society and how these structures affect our lives and the way we view ourselves and others, right down to the subtlest levels. As human beings, why do we relate to each other the way we do? Does technology ultimately enrich or detract from human interactions? And what are the consequences to our society/world when the technology we create evolves exponentially faster than we evolve as human beings? Ultimately, I attempt to ponder and address these questions by creating works that convey a sense of beauty, humor, joy, magic, and mystery. It is my hope that my art provides a kind of creative balance in these difficult times, as well as an impetus for others to reflect on the questions, ideas, and possibilities that these works present. Renée Stout was raised in Pittsburgh, Pennsylvania, and received her BFA from Carnegie Mellon University in 1980. Based in Washington, DC, since 1985, she is the recipient of many awards, including the Joan Mitchell Foundation Award, the Pollock-Krasner Foundation Award, the Louis Comfort Tiffany Foundation Award, the High Museum of Art’s Driskell Prize, and the Sondheim Award. Stout has shown throughout the United States, and her work is in several national and international museums’ collections.